Panelists: James Anderson, Pierre Herckes, Jennifer Vanos, Edward Kavazanjian, Alex Mahalov, and Jean Andino. Moderator: Matthew Fraser. Panelists: Patricia Gober, Dave D. White, David Sampson, Amber Wutich, and Stephen Elser. 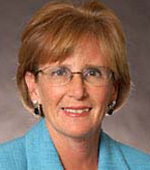 Moderator: Ray Quay. Panelists: Peter Crank, Ashley Broadbent, Paul Coseo, Kamil Kaloush, Elizabeth Kurtz, and Jennifer Vanos. Moderator: David Hondula. Panelists: Yuliya Dzyuban, Melissa Guardaro, Ariane Middel, David Sailor, and Nicholas Weller. Moderator: Charles L. Redman. Extreme heat, air quality, and water resources are key factors related to health in urban areas and ASU is a research leader for each of these factors. 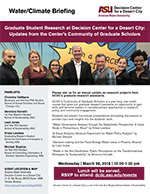 Please join us for an annual update on research projects from DCDC’s graduate research assistants. DCDC’s Community of Graduate Scholars is a year-long, one-credit course that gives our graduate research assistants an opportunity to gain skills and become leaders in transdisciplinary approaches to research, policy, and community engagement. 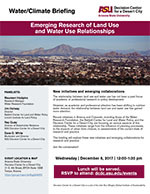 The relationship between land use and water use has not been a past focus of academic or professional research or policy development. 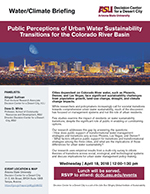 However, as academic and professional attention has been shifting to outdoor water demand, the relationship between land use and water use has gained more attention. 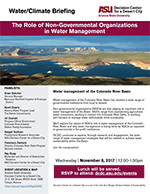 Water management of the Colorado River Basin has involved a wide range of governmental institutions from local to federal. Planning for sustainable water management involves working with a wide network of complex social and natural adaptive systems. A decision support system to inform integrated water resource management. While there are common challenges in water management around the world, sustainability issues manifest themselves in specific ways in each region based on the local context. Arizona is home to twenty-two Native American tribes located around the state. 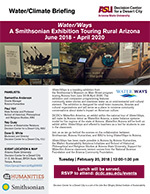 With different geographical locations, water needs, and water supplies, these tribes have both similar and unique perspectives and challenges to water security. From the Colorado River Delta to Mexico City, water challenges shared by the U.S. and Mexico have resulted in collaboration and research to find solutions.